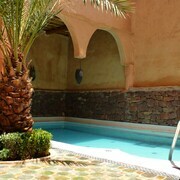 Situated in Tinghir, this riad is within a 15-minute walk of Tinghir Park and Resistance Plaza. Todra Gorge is 10.2 mi (16.4 km) away. 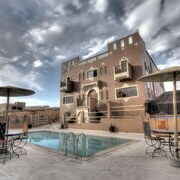 Situated in Tinghir, this riad is 1.6 mi (2.6 km) from Tinghir Park and 1.7 mi (2.7 km) from Resistance Plaza. Todra Gorge is 11.2 mi (18 km) away. Whether you’re camping in the Outback, posting up in a tent in the deserts of Africa, or spending the night in an igloo, you tend to go all out when it comes to holiday accommodation. (OK, an igloo is a little extreme, but we wouldn’t put it past you.) We get it: Regular hotels are so overrated, especially when you’re in a place as amazing as Morocco. You need open-air courtyards to soak in the atmosphere and perfectly romantic balconies to re-enact “Romeo and Juliet” (you know the scene we’re talking about). 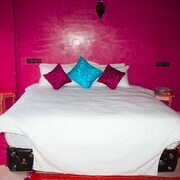 You need to book a riad in Tinghir. Riads are uber-private, quiet, and secluded—that was actually the whole point, when they were built for wealthy Moroccans back in the day. You can stay right in the middle of Tinghir, but you won’t hear a peep of city noise. Not that you should stay inside: This holiday is all about gorg scenery and hashtag-worthy meals. 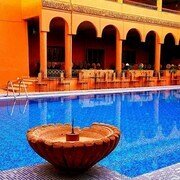 Your social media followers will never believe you stayed in a Tinghir riad hotel on a budget. Ready to check off another place on your bucket list? You’ve gotta stay in a riad. Any spot that was built for the socialites of the 10th century will be luxurious, so you might be surprised at the cheap riad accommodation you can find here on lastminute.com.au. You won’t have to give up your modern amenities, either—book today and holiday in style. 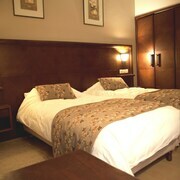 Situated in Tinghir, this hotel is 1.7 mi (2.7 km) from Tinghir Park and 1.8 mi (2.9 km) from Resistance Plaza. Todra Gorge is 11.2 mi (18.1 km) away. 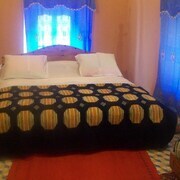 Situated in Tinghir, this guesthouse is within a 5-minute walk of Resistance Plaza and Tinghir Park. Todra Gorge is 10.2 mi (16.4 km) away. Situated in Tinghir, this guesthouse is within a 10-minute walk of Tinghir Park and Resistance Plaza. Todra Gorge is 9.9 mi (15.9 km) away.